A spirit with characteristic green color using the mugwort family "Artemisia absinthum", which is also found in the wormwood is used. First mentions of an absinthe-like drink come from the antique Greece. Pythagoras (570 to 510 BC) and Hippocrates (460 to 377 BC) reported on its healing power, its effect as aphrodisiac and the increase in creativity that they experienced through the drink. The original recipe of Absinthe originally did not contain any anise, It actually had a medicinal, invigorating effect in mind and was made from wormwood oil, sage oil, lemon balm, violet root oil, cinnamon, made some secret ingredients and chlorophyll extract (hence "the green fairy"). First Henri-Louis Pernod (1776-1851) also added Anis after he had bought the recipe at the end of the 18th century and had first built a production in Switzerland and then in France. After the ban on absinthe at the beginning of the 20th century, Pernod had to change the recipe; the spirit now no longer contained absinthe. In the 18th and 19th centuries, absinthe schnapps, in particular Pernod, which at that time still contained absinthe, was very popular under the name "Fée verte" (Green Fairy). Especially in artist circles (painters, writers, actors) he became a true cult drink. These included Charles Baudelaire, Paul Gauguin, Vincent van Gogh, Ernest Hemingway, Guy Maupassant, Pablo Picasso, Edgar Allan Poe, Jean-Arthur Rimbaud, Henri Toulouse-Lautrec and Oscar Wilde. The painter Vincent van Gogh (1853-1890) allegedly cut off his ear in the absinthe intoxication. At the beginning of the 20th century, absinthe was found to be the most harmful neurotoxin in the world thujone contains. The manufacture was therefore banned in France in 1915 and in Germany in 1923, as well as in most European countries and in the United States. Certain symptoms have been attributed to chronic absinthe consumption, but today it is known that these were caused more by alcohol. 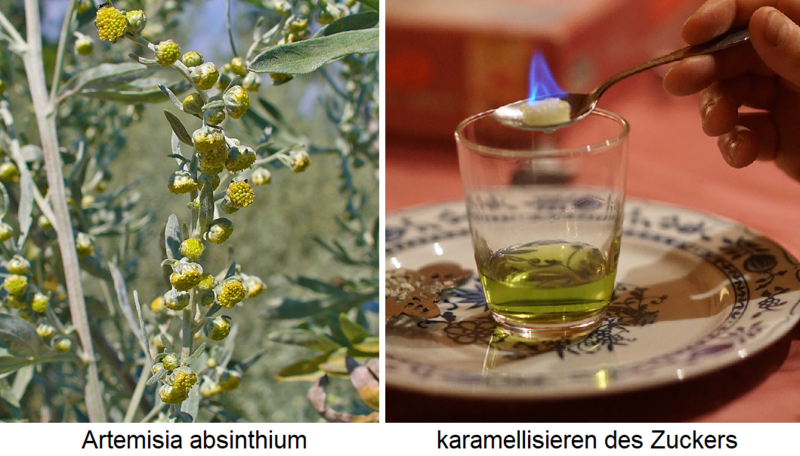 The symptoms of the so-called "Absinthism" are identical to those of one alcoholism, For the production of absinth in the 19th century was also often used inferior alcohol, the methanol and fusel oil contained. Analyzes of pre-ban Absinthe samples in 2008 revealed concentrations as low as 25 mg / L on average. At these levels, psychotropic effects are highly unlikely. Since 1988, absinthe has been allowed in EU countries. The permitted content of thujone in alcoholic beverages is limited to a maximum of 35 milligrams per liter. The according to the old original recipe of the company Pernod Ricard Absinthe produced has 68% vol alcohol content. He developed just as before again to a cult drink. Similar to others Anise Spirits such as ouzo absinthe is mixed with water (ice water) at a ratio of between 1: 1 and 1: 5, causing the liquid to turn milky ( Ouzo effect ). Special drinking rituals have developed around the cult drink. There is a French, a Swiss and a Czech variant. The latter is also called fire ritual, because one and two sugar cubes soaked in absinthe are placed on an absinthe spoon and set on fire. Once the sugar caramelized and blowing bubbles, the flames are extinguished and the sugar is added to the absinthe, which causes the typical taste. This page was last modified at 4 January 2019 at 16:03.